posted: Feb. 3, 2017, 7:50 p.m. | updated: April 24, 2017, 11:21 p.m.
La La Land is a musical movie filled with nostalgia and romance. But what really hits hard in a suprisingly good way is how well everything fits in. Be it the stellar direction, the hard work that went in to writing each character, the tiny nuances that the lead actors - Ryan Gosling and Emma Stone - play their characters with, and the sweet tune that stays in the mind long after the movie is over. 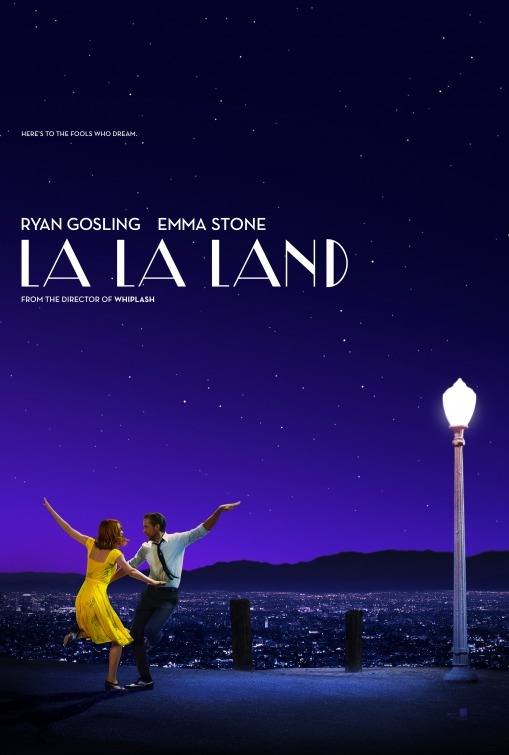 While seemingly a run-of-the-mill romance consisting of lead characters who do not like each other, then fall in love, fight and break-up, only to come back together in a dreamy sequence that ends in them kissing in close-up on screen; La la land is spectacularly different while still retaining the things that are really good from musicals. The film starts with a dance sequence on the freeway - one that seems to be one continuos shot for the entire sequence - and is really really well made as an introduction to the premise of the film. The sequence does not contain any of the lead characters, but consists entirely of people stuck in the traffic, and acts as the introduction to the city that is Los Angeles. Seasons form an structural guideline as the characters feel, behave, and live by it. The film starts in Winter, which stands for coldness, isolation, loneliness, and sadness. The characters are loners, not able to fit in, struggling with their respective careers. She's an aspiring actress who can't seem to have an audition without someone interrupting for lunch or lost keys. He is a jazz pianist, trying to shine in a dying art that people do not care about. They both meet in Spring, where they confess their dreams and passions to each other, and then get together in Summer. It seems perfect - she finally completes a one-woman play starring herself, and manages to throw together a show. He has a regular gig with a jazz place that lets him play. Towards Fall though, both of them start drifting away. Both grow distant from each other and their careers. She is disenchanted because of the nasty comments from the people leaving the theater. He overhears her speaking to her mother about his career, and takes up a job with a band his classmate from school has started. The band mixes jazz with synth, something he is not passionate about. They both fall out. One day, he gets a call from a casting director, who has decided to cast her, and he rushes to her hometown. She gets the part, but it is in Paris, and they decide to focus on their careers and give it everything they have. They promise they will love each other always. And then they go away. The film moves forward five years, where she is a famous actress, married, has a daughter, and is on her way to a party. Stuck in the traffic, the couple takes a detour and lands in a jazz club where she finds him. They both look at each other, stunned, and as he plays their love theme, and they both imagine what life would have been like would they still have been together. It is one of the most wonderful moments in films, and evokes the memory scene from Up. Towards the end, they both share a look, and go back to their lives. The film received multiple oscar nominations, and rightly so, it is really well made. A solid recommendation to anyone who still hasn't seen it yet - go watch it twice.